Seasons of the Heart is a journey that begins with a memory. Bitter and sweet, the days of our lives are full of winters and springs. Of summers where we dance and stark autumn moments when we grieve. In this beautiful celebration of the artist’s memories we walk with her through some of life’s most personal moments. Produced by Will Ackerman at the legendary Imaginary Road Studio, this album is also graced by Jill Haley (English horn), Charlie Bisharat (violin), Eugene Friesen (cello), Jeff Haynes (percussion), Noah Wilding (vocals), Tom Eaton (bass), and Michael Manring (fretless bass) and of course Reneé Michele at the helm of the piano. “Gone” is the devastation of a loved one’s passing. The loving memories of a life well spent, but the absence where there once was a presence. Some voids simply cannot be filled. Fluid piano movements and tender whispers call out to those we love in remembrance and thankfulness that our lives touched, if only for a moment. “Forgiveness” is an evocative piece that tears into the tender places in the heart where some of the deepest emotions dwell. Who has not been hurt by a loved one or been the one to cause the pain? Love is a scary and beautiful thing, much like the resonating melodies presented in this piece. Careful piano movements and string presentations delve deep. Tear stained cheeks and eyes that smile through the pain that only true love can cause bring the joy of forgiveness. “Seasons of the Heart” is an all-encompassing voyage through the dark hour of the soul and back to light again. Our lives, like this vision of melodic wonder, are rife with challenges, hurts, victories and celebrations. Love, life and laughter walk with us even as death and unfortunate events bring us to our knees. The seasons change and with it the ebb and flow of our inner tides. Poignant piano playing combined with multi-instrumentation brings out the deep emotion that only Reneé Michele can. She finds the perfect note and spins her song, leaving us breathless with the beauty of truth. Our lives truly are seasons. Memories come to us from the summer and winter of our lives. Some are bountiful and some haunt us with broken promises and hurtful actions whether from ourselves or others. 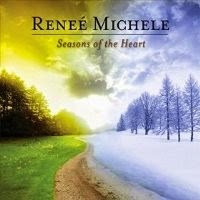 In true artful fashion, Reneé Michele takes each feeling and brings it to the surface in melodious fashion. These are the seasons of our lives; the sun, the moon, the seasons…new beginnings and bittersweet endings. It is the breath in our bodies and the secret smile on the lips. It is music. It is…life.